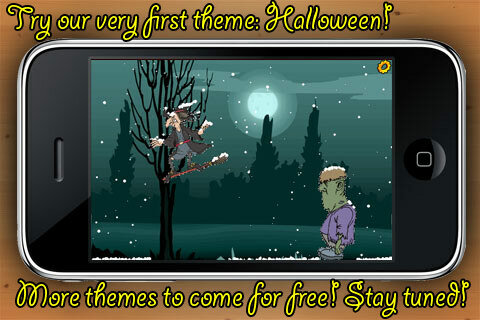 The Halloween theme is full of background images, figures and objects to be placed on the screen. Watch the snow fall and roll over them. Use your finger to drop realistic snowflakes. 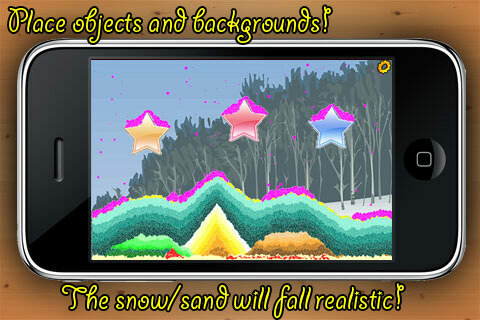 Or "turn on" automatic snow, and the screen will be filled with falling snowflakes (or sand! ), which will roll over the snow-mountains and objects. 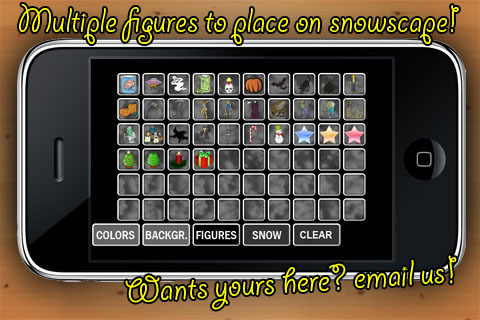 The "snow" will use the currently selected color, so you are not limited to white snow. 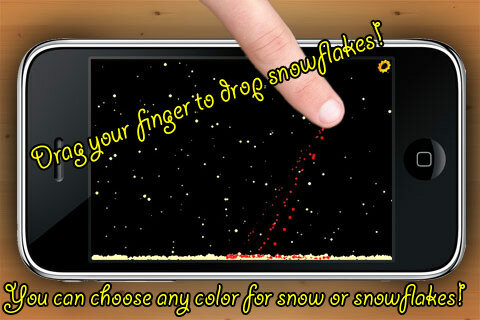 You can even have snow falling automatically in one color while you control a different color of snow with your finger! We are preparing (for free!) a full Christmas theme. If you would like to see your own artwork in our next theme, visit www.diniplay.com and submit your images! We plan to add as many features as we can imagine, like drawing on the screen. Just visit our web and let us know your great ideas! Costs: 0.79€ / 0.99$ FREE! Are you ready to become a Garbage Collector? You have to sort trash into different bins. But be careful! "Easy": The trash is slow and you have a ingame-tutorial to learn where you have to put the trash in. "Hard": The trash will start normally but after a short time it will be much faster and you don¥t have a tutorial or sth. like that! Try to sort all the trash get respect and a big highscore! The #1 in Jupiter, Saturn, Mars and Moon is finally on App Store!!! Help Ulises to save her girlfriend Penelope from the hands of the evil Andromaco in this epic jorney through planets and even time !! Are you fast, smart and strong enough to face traps, enemies and complex levels in this non-stop super game? - Use accelerometer to move Ulises and use your fingers to jump, cut ropes to drop hanging bridges, move switches, break blocks to make your way and much more! - Move barrels to reach higher places or splash enemies! - Openfeint integration (Leaderboard) ! - 8 Music track from Manuel Sahagún (www.manuelsahagun.com.ar), one of the exciting new talents in the house music scene ! It's no killer app by any means, but hey you've got to start somewhere I'll also put up a free version with all the option settings removed. Yes, it is JUST PONG, and it looks like any other pong game out there, but this pong game has better features and plays better than the original or most pong games out there. Did you know that the original pong has been around since 1972. The game is still fun and addictive, and that's why consumers love the game of pong, not to mention the simplicity of the game. Pong is all about angles, so that's what I improved. The paddles are using a convex formula. The problem with most of the clones is that the ball just bounces in the opposite direction, like a laser reflecting off of a mirror. 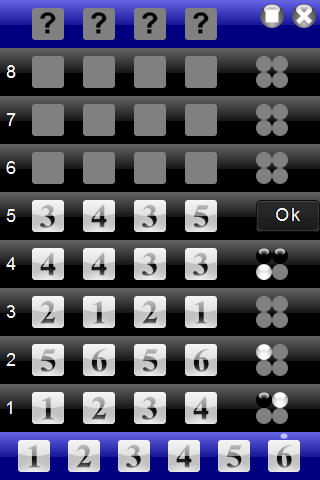 With convex paddles you have more control of the ball so it's a lot more challenging. Next I had to make the AI good, to keep you coming back for more. There is an easy and hard mode. Hard mode is very challenging, but not so much where you get frustrated. It's very easy to play, just touch and move the paddle to hit the ball. Try to hit the ball past the other players paddle to score. The first person to score 11 points wins. Two player mode, grab a friend and paddles and go at it! Cute, fun and very addictive! Survival of the flowers is at stake! helping them through their pollen shortage. distance possible, pollinating as many flowers as you can. Watch out for the evil flowers and other nasties on the way! Optimised performance for Iphone 3g can be set within the options screen. "Bumble" might look cute, but he is a bee on a mission! Tap the falling numbers until they become stars and don't let anything but the stars hit the bottom. You play as Santa who has been sabotaged in an attempt to prevent a merry Christmas for the children. Rather than repeat the details, check out the link for some screen shots and a more detailed description of the game. 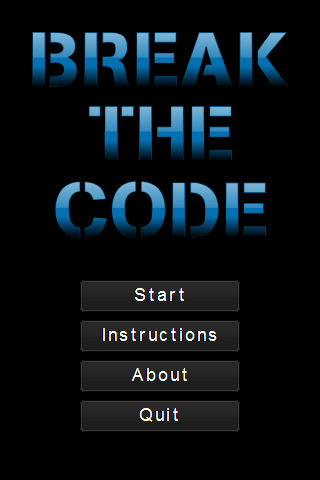 We are in the works of adding additional levels that wrap up the story as to who is behind the sabotage. We plan to release the update after Christmas. We are quite proud of it and excited about the update planned for it. 50 ancient Egyptian temples… Resolve their curse! Red and green need to change positions, but up to eight grey guards block their way. Each step you take is answered by the step of a guard – you’re caught within a labyrinth of moving walls! 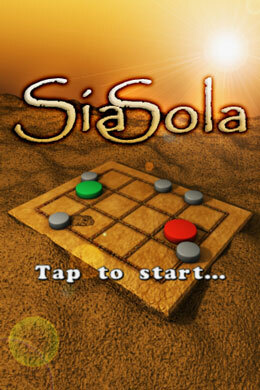 Sia Sola is a sliding block puzzle game with a novel and dynamical moving rule. You may move a stone if its way is blocked by a single guard only. But this causes the guard you’ve passed to swap its position, too. Hence, the labyrinth changed its shape! If you finally managed to interchange the position of the two big stones, you’re done. Can you do it with a minimum number of steps? 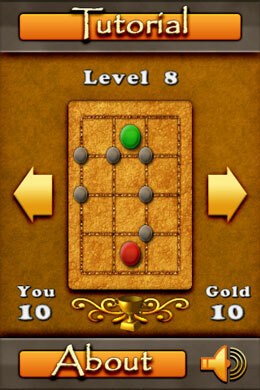 The full game contains more than 50 levels of increasing difficulty. To get you into the game, a tutorial is included. While the first levels are introductory ones, most of the levels need some clues to be solved – and the last ones are really tricky! Yet there is a tale of secret levels to unlock, barely solvable by a mortal mind… May Sia, Egyptian goddess of cleverness, guide you through this challenging puzzle! 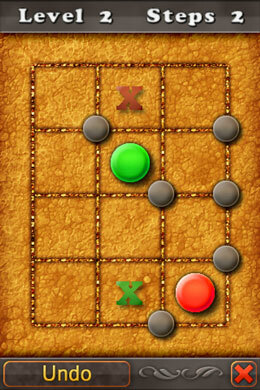 Triple Dutch is a Dutch-themed game, containing three innovative puzzle games. The games are based on windmills, flowers and cheese. Rotate windmills, move flowerbeds and slide the cheese to the exit... can you solve all 70 puzzles? THIS IS A MUST HAVE FOR ANY BELLY DANCER FAN! Shake and try to get the best high score in rhythm with the music! This is a fun and addictive game made for lovers of belly dancing or any Rhythm game fanatics. -just a lot of fun! Thanks to everyone for the advice and help! Have you your finger enough fast? The object of this action game is destroy all dishes using less time possible. Shooting all dishes before you run out of time. For destroy the dish, touch it with the finger. The amount of time you have to clear depends on the difficulty level! 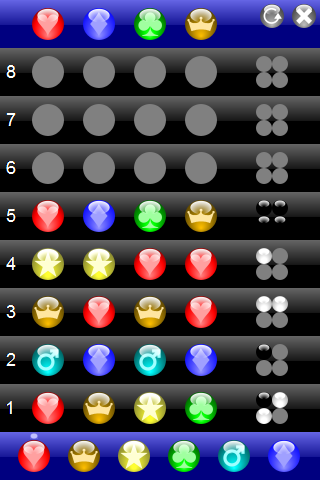 There are three level of difficulty, ever with 30 stage. Each level of difficulty change a dimension of the dishes: Pizza plate, Dinner plate and Dessert plate. iOS: Entertainment, Music / Universal / Update 1.4 with BT. Various randomly digitized generated sound effects. There are hundreds of simulated sounds of all sorts of noises like sci-fi guns, alarms, insects, percussion instruments, horn, beep, zap, drip, buzz, birds, woodpecker, chirp, wind, crash and motors. 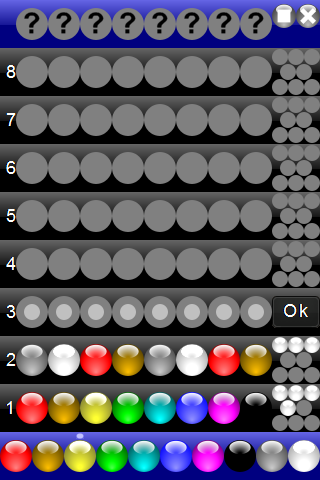 Press or hold one to five fingers to play mixed effects and just shake to generate twelve new sounds. Great to use with a sound amplifier also. Connect with the Bluetooth Connection Module to swap sounds from one device to another. Press on one device and the sound plays on the another. Great for a copy-cat game. A simple tune cycle button creates loops so sounds are played back to create beats. Bluetooth Connection Swap Module. Use one device to send the button presses to another device which outputs the sound. Simple tune cycle looping of a couple of seconds duration. iFulmini is a funny application that simulates lightnings in a different colors and size. Allows you to play with simulated lightnings on your iPhone! Move your fingers on your iPhone/iPod around the screen and the lightnings will follow your fingers. Customize your lightnings by selecting the thickness of the lightning and choosing your favourite color each for lightning. Use up to five finger for create and move the lightnings. Note : double tap for menu.